Incorporating Process Analytical Technology (PAT) into a reactor bottom outlet valve, using the MultiProbe® – SchuF PAT Solution allows analysis, and control to be carried out by taking measurements DURING pharmacetical and chemical manufacturing. The use of PAT probes enables real time knowledge of the critical process control parameters such as reaction initiation/endpoint, reaction progression, Intermediate formation, concentration, yield etc. The aim is to reduce production cycling time and product sampling, preventing rejection of batches; as any problems arising can be corrected or stopped before energy and valuable medium is wasted. While taking timely measurements (during the process) is nothing new; in the past there have always been issues. One of the biggest of these challenges is finding a suitable point for a probe to enter the reactor vessel; modifying a vessel is expensive, requires revalidation and may not be permitted due to the vessels structural integrity being compromised. Entry via the vessel top would seem to be a better option than compromising the fabric of the vessel, but longer cables can lead to significantly less reliable signals from the probe. Other options that have been tried to lesser or greater success include the incorporation of PAT probes into recirculation sampling loops, but this raises safety concerns about residue in flexible hoses and problems handling slurries. 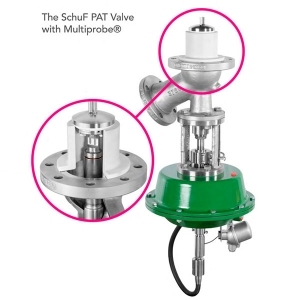 It took an innovation from SchuF, the market leader in drain valves for pharmaceutical and chemical applications, to provide an easy to install, accurate, reliable and effective solution to all the old challenges; enabling manufacturers to access process analysis data directly through the reactor bottom outlet by using a specially designed valve that incorporates a PAT probe. The PAT probe protrudes through the valve actuator, stem and disc, to perform measurements in the body of the liquid held in the reactor. Because the probe has to be directly exposed to the medium being analyzed SchuF’s unique Multiprobe design ensures that the medium in the reactor does not leak into the valve spindle and that the probe can be removed quickly between batches without removing the valve from the vessel. As always SchuF valves that incorporate PAT technology using the MultiProbe arrangement can be built to a wide range of customer specifications including a wide range of materials such as hastelloy, glass and PFA lining; and all are designed to be compatible with numerous actuator types, sizes and accessories. PAT tools come in various forms of immersion probes such as Infrared (IR) probes, Turbidity probes and PH probes for applications where direct insertion into a reactor vessel is required. The full range of SchuF products including PAT compatible with Multiprobe are available exclusively in the UK from Valve & Process Solutions Ltd. Previous Post WANT TO CHANGE THE WORLD? LOVE CHEMICAL ENGINEERING!